We’ve had fantastic fun today working with the Stuff and Nonsense Theatre Company who have been running some workshops today. Stuff and Nonsense are a well-known theatre company that develop and perform shows for children using puppets. They are also passionate about involving children in the development of these shows. Today our students were helping to develop their new show ‘The Man who wanted to be a Penguin’. The workshops explored how children find ways to express themselves emotionally and creatively, particularly when language is a barrier. 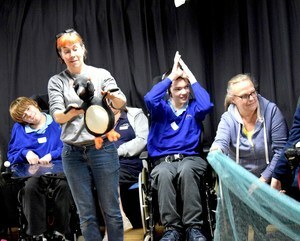 The workshops also included opportunities to explore communication through puppets and as part of the process they invented a new Penguin language. The workshops were led by Niki McCretton, their artistic director, who has many years of experience of working with children and young people through the 5x5x5=creativity scheme. Huge thanks to Niki and the crew and Belinda Ellicott.